Girls just wanna have FUN! 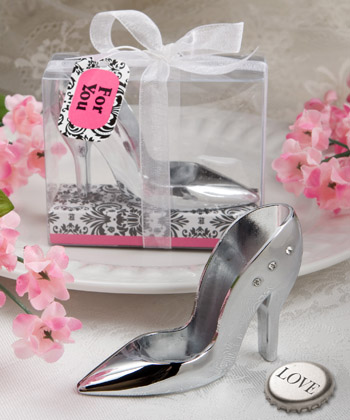 Put your best foot forward with these high heel shoe design bottle openers as your favors! It?s a shoe in that your guests are going to love these adorable ? and useful ? bottle opener favors. Looking like they just stepped off the high fashion runway, each measures 3? long x 1?? tall x 1? wide and is made of chrome finished silver metal in the shape of a high heel shoe, with three sparkling rhinestone accents on either side of the heel and the bottle opener tucked in the underside. Great as bachelorette party favors, Cinderella themed favors, and for any girl party favors, each comes in a clear acetate box with a pink-line-accented white and black damask design staging insert, tied with a white organza ribbon and an attached matching design ?For You? tag.